When playing roulette, it is luck that decides the outcome and the most effective strategies are those focusing on the wagering patterns, not those trying to predict the outcome. Players should know the odds of each type of bet turning into a winner, and decide which wagers are more suitable for their budget and winning expectations. The risk averse players will naturally prefer even bets, while those who count on significant profits are willing to wager on clusters of numbers and even individual ones. Depending on what type of roulette they choose, the house edge will slightly differ, with a 5.26% edge in American roulette and only 2.70% in the European version. The only exception to the rule is the five number bet that carries a house edge of 7.89% in American roulette. All equal bets pay one dollar for each dollar invested and these are even, odd, black and red bets, as well as wagers made on numbers ranging from 1 to 18 or 19 to 36. The probability to win is 47.37% in American roulette and 48.6% in European one which makes them the safest wagers, but also the ones paying the lowest amounts. The next in line are the Column and Dozens Bets as betting on numbers ranging from 1 to 12, 13 to 24 or 25 to 36 awards payouts of 2 to 1, while the odds of winning stand at 31.58% and 32.4% depending on what type of roulette you choose. A distinct category of bets are those focused on a string of numbers, with the Sixline carrying odds of 15.79% in American and 16.2% in European roulette while the payouts in both cases are 5 to 1. The five number bet has a chance of roughly 13%, and Corner Bets have odds of 10.84% or 10.53%, once again depending on how many zero slots are on the roulette wheel. The roulette chances for a Street bet are 7.89% in American roulette and 8.1% in the European one, while the same roulettes have chances of 5.26% and 5.40% for a Split bet. The street bet is a wager made on three different numbers, while the split bet is made when the same chips are invested on two numbers. 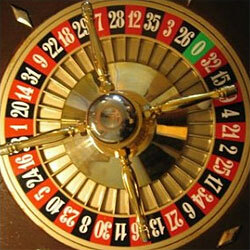 These minimalistic combinations are among the best paying ones, as the roulette pays 17 to 1 or 11 to 1. The type of bet that awards the highest payouts is definitely the single number wager, with those lucky enough to predict the number on which the ball will land, having their wager paid 35 to 1. The difference is minimal between American and European roulette when it comes to the odds of this event to occur, with the first having a 2.63% chance while the latter slightly boosting them to 2.70%. Knowing how likely it is for each of these wagers to turn into winners, should help players decide which types of bets they intend to pursue, without taking unnecessary chances or hurting their bankrolls.